Lough Neagh Events Easter 2019: The Lord Mayor of Armagh City, Banbridge and Craigavon, Councillor Julie Flaherty, is hosting an 'egg-citing' Easter Egg Trail for all your little bunnies in Portadown People's Park on Thursday 18th April from 2pm - 4pm! 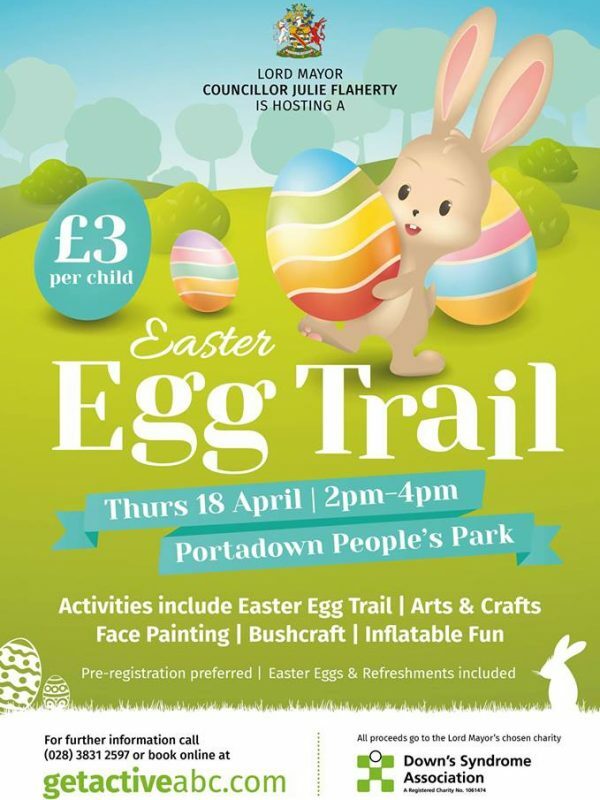 The Lord Mayor of Armagh City, Banbridge and Craigavon, Councillor Julie Flaherty, is hosting an ‘egg-citing’ Easter Egg Trail for all your little bunnies in Portadown People’s Park on Thursday 18th April from 2pm – 4pm! Fun-filled activities on the day include face painting, inflatable fun, bushcraft, arts and crafts and of course a fabulous Easter egg trail with characters to keep all your little ones entertained – all for just £3 per child! Proceeds of the afternoon will go to the Lord Mayor’s Charity, – the Downs Syndrome Association NI. A brilliant way to kick start the Easter holidays!